I woke up almost an hour before my alarm, and Lisa and I ended up going down to room 230 where the Business Meeting is happening very early. That was for the best, because it gave us extra time to get everything set up for the first Business Meeting. As I have explained, the "Second Stage" room, which seats over 800 people, isn't used in the morning, but has the tech setup we can use. 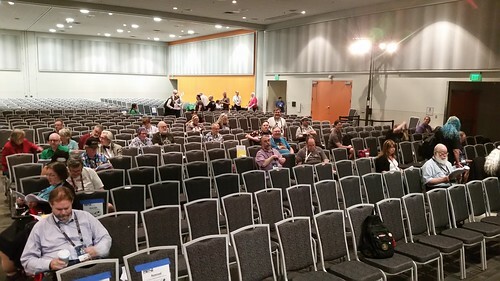 By putting the Business Meeting in this oversized room, Programming could more effectively use the other programming space at the other end of the convention center. Consequently, we sort of rattled around in the room. But the setup had a lot to commend it. Lisa's camera platform was rock-solid. The convention center ran an audio cable over to feed into her camera. There was a high-speed wired internet connection at the camera platform that Lisa's assistant, Scott Sanford, could use to upload Business Meeting videos. 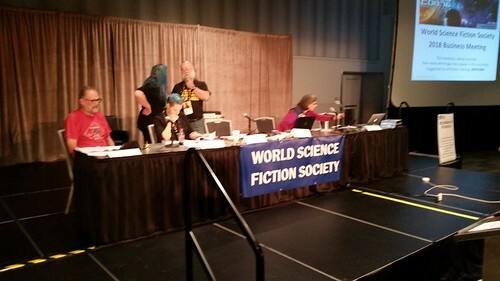 The videos are in the Worldcon Events 2018 WSFS Business Meeting YouTube Playlist. The head table wasn't quite as happy about the setup. The stage lighting made it harder to see people in the audience, and Chair Tim Illingworth had to tell people that certain seats made them effectively invisible on account of the lights blinded him in those locations. This year's Business was a lot less contentious than the last few years, and a lot fewer people showed up to discuss it. And as usual, there's a mistaken impression that because the first meeting is called "Preliminary" that it can be skipped without missing anything important. That's not the case, because the Preliminary Business Meeting can kill new proposals (but not constitutional amendments awaiting ratification) outright, mostly by using the motion to "Postpone Indefinitely," which in practical terms knocks proposals off the agenda. Refer to the 2018 WSFS Business Meeting Agenda for details of the proposals I list below. These are changes to the Business Meeting's procedural rules and could be adopted directly by the Preliminary Business Meeting. They first take effect at next year's Business Meeting. Because of the nature of these changes, they could not be made to take effect immediately by any vote, as it would require a time machine. A.1: Amendments to constitutional amendments awaiting ratification must be submitted by the same deadline that applies to submitting new constitutional amendments. A.2: The deadline for submitting new business is now 30 days before the Preliminary Business Meeting (it was 14 days). The four constitutional amendments awaiting ratification had debate time limits set for the main meeting. No other action could be taken on them. The Preliminary Meeting wanted at more than one point to refer several of these proposals to the Hugo Awards Study Committee. However, WSFS Standing Rules don't allow the PBM to refer proposals to committees unless they report back to that year's Business Meeting. There was an attempt to Suspend the Rules to allow that referral. I regrettably had to raise a point of order (which, when the chair ruled in my failure, was appealed and sustained) that for reasons having to do with people being able to rely on certain things not happening at the Preliminary Business Meeting, the rule about referral can't be suspended. That is, if you want to refer to committee to report next year, you have to do it at the main meeting. D.1. Remote But Real: Removes restrictions about remote participation at the Business Meeting (although it does not require provision for such remote participation). This is likely to be contentious. I'll be arguing against it myself. An attempt to postpone it indefinitely failed. D.2. Adding Series to Series. Minor technical amendment that corrects an error whereby Best Series is added to the list of categories in section 3.2.6. The Nitpicking & Flyspecking Committee thinks this was the original intent when we adopted Best Series. Debate time adopted. Not expected to be contentious. D.3. Counting Comics. Would have modified the way that Graphic Story works were counted. Postponed Indefinitely on a vote of 59-26 (2/3 required) and will not be on the Main agenda. D.5. Professional and Fan Artist Hugo Awards. Postponed to Sunday meeting not before 11 AM. The ASFA Business Meeting is on Saturday overlapping the WSFS Meeting. This postponement means that artists, who would be most affected by this proposal, have an opportunity to participate in the debate. D.6. Comic Books and Graphic Stories. Adds "or Comic" to the title of the existing Best Graphic Story Hugo Award but does not otherwise change the definition of the category. Not expected to be contentious. D.7. Notability Still Matters. Cleans up a small oversight in the way we are required to report Hugo Award nominees that was introduced when E Pluribus Hugo was adopted. Not expected to be contentious. In addition, four people were nominated to fill the three WSFS Mark Protection Committee seats up for election; therefore, we'll have to hold an actual election rather than suspend the rules and elect by acclimation, which we've done when there are the same number of nominees as seats. The Preliminary Business Meeting took only about two hours. We have some hope that we can get everything done by the time we have to adjourn on Sunday (12:15) for the Worldcon Chairs Photo Session. Fingers crossed that we don't have to go in "overtime" this year and I can sleep in for an hour on Monday morning.